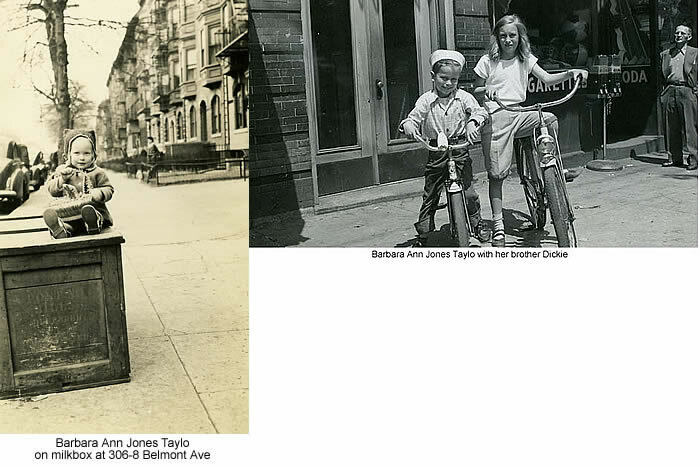 I grew up on the corner of Belmont and Avon Avenues, from 1940 to 1958. A double set of doors, led to a vestibule, the floor and walls were white tile with black trim. There were brass mailboxes built into the walls for each of the 13 apartments. A second door led to a long hallway, our apartment was at the end on the left. To the right, was the stairway which led to the 12 apartments upstairs, 4 on each floor. On either side of the entrance were stores. One a grocer and the other a candy store. My father, Thomas Jones was "the super" for the building along with his full time job at Westinghouse in Newark, where he worked for 49 years. Most of our neighbors were of the Jewish faith. When I was little, all my friends had off school for the Jewish holy days, I would cry because I wasn't Jewish. On Christmas Eve, it was another story; it was 'open house' at the Jones's. All of my extended family would drop by for some of Mom's famous Christmas cookies and to help decorate the tree, we always had a houseful. We were all of different faiths and nationalities, and we were like one big happy family. The grocery store on the left was owned first by Herman Moskowitz, then Ben Singer, then Herbie Shapiro. The candy store on the right was owned first by Gussie Wallerstein, then the Berkowitzs', the Shulmans' and then the Spatzs'. Around the corner, on Avon Ave. which was a hill, was a shoemaker, Joe Sikora. His shop was behind and under the candy store and our apartment. All the store owners were also very good neighbors. Mr. Sikora would supply all the neighborhood kids with used heels for our hopscotch games and tighten our roller skates when we couldn't find a skate key. Theresa Jespersen, lived on the 4th floor, we were 3 yrs old when she moved in, we grew up together. We played hopscotch, red light/green light, jump rope, double Dutch on the nice wide side walk in front of our building. We used to signal each other when we were going out to play, by banging out a secret code on the steam pipe in our bedroom, hers was 4 floors directly above mine. As we got older we'd roller skate or bike ride all over the area. We would get a group together and go for a picnic to Weequahic Park. In our teen years we rode the bus to Olympic Park. Some days we packed a lunch and spent the day at the pool. Other times, I think it was Wednesday, we would get one of those long strips of tickets, and all the rides were 5 or 10 cents. No one in the building had a phone in the forties. All phone calls were made from the candy store payphone. In an emergency family would call the candy store and the owner would send someone to get us. No one took advantage of this courtesy and when we were called it was usually because someone in the family died. I remember when we did get a phone installed, we were probably the last in the building, I was so excited to be able to call my classmates. My brother Dickie and I collected newspapers from the basement. On Saturday we would take them in our red wagon to the junk yard on Badger Ave and would get money for our load. It was always enough to go to the Avon Theater on Clinton Ave. for a double feature. As the neighbors in the building noticed our little job, they ALL started saving their papers in the basement and before long we had to ask Dad to take our papers in the car. Dad made us put our 'extra' money in our Howard School Savings account. One thing all apartment house dwellers in Old Newark had in common was sunbathing on the roof, or tar beach as some called it. Our roof was rather special because our landlady had a tanning bed mounted on a track up there. It could be turned in the direction of the sun and was completely enclosed with canvas. When we were little, Theresa and I spent hours pretending it was our house and having tea parties in it. As we grew up we joined the ladies for the tanning sessions. There was also an enclosed shower on our roof, nice for cooling off. All the ladies brought some goodies to share; pitchers of grape juice, cookies, pretzels etc. We styled each others hair, did our nails, shared magazines and just enjoyed the sun. On the night of July 4th everyone went on the roof to watch the fireworks, we could see them from many different locations in Newark. In Jan.'57 Mom & Dad surprised us with a baby brother, Edward. What joy and excitement there was in our building, it had been a long while since there was a "little one" around. Needless to say, he was showered with attention. It was somewhat crowded in our 4 rooms, but Mom & Dad agreed not to move, but let me finish South Side, so I could graduate with my class in Jan. '58. That was another 'extended' family celebration! Mom had an 'open house' and a sheet cake, many of the neighbors came. And I still have some of the gifts I received, earrings and hankies with my name or initials embroided on. During high school, I worked part time at the Globe Shoe Co on Avon Ave, Woolworths 5 &10 on Broad & Market, Consolidated Laundries off Elizabeth Ave and then the Newark Evening News, which became full time after graduation. Had some great experiences with all of them. These are some of my memories of 306 Belmont Ave in Newark. I was blessed as a child to have lived there.